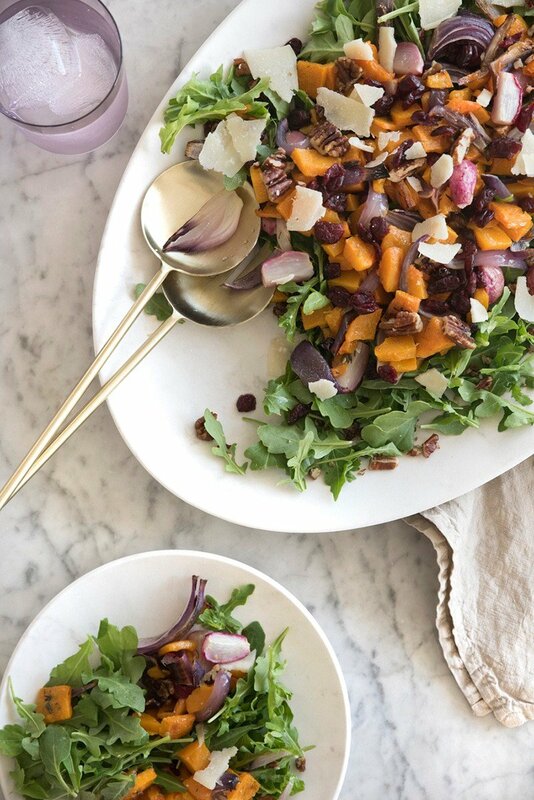 This scrumptious roasted vegetable salad packs all the fall flavors into each and every bite. 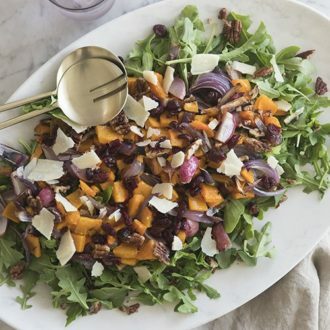 Roasted butternut squash, sweet onions and radishes on a bed of peppery arugula, topped with a sprinkling of dried cranberries, candied pecans and shaved pecorino Romano. The whole thing is drizzled with a rich and tangy balsamic vinaigrette with lots of fresh thyme! Roasting vegetables intensifies their flavor, caramelizes the sugars inside and of course softens them. I’m only telling you what you probably already know to remind you how perfect they are for a salad! Prep Everything Ahead of Time! The veggies can be roasted ahead of time and the candied pecans keep for a while so you can do all the prep work ahead of time and of course the dressing will keep for a while if refrigerated. Just assemble before serving and enjoy! I loved this salad as is but you should feel free to use all of your favorite veggies and make this dish your own! 1.) Cut and peel the squash. You can start by peeling it or halving it. Use a spoon to remove the seeds. 2.) Slice the the squash into roughly half inch pieces. 3.) Chop the sliced butternut squash every one inch or so. You can really cut the squash however you like but I like this size for the visual it gives and the way it sits on your fork. 4.) Trim the top and bottom of your onion, peel and chop the onions into wedges. 5.) Trim the top and bottom of the radishes and quarter. 6.) Arrange squash, onion, and radish pieces on a baking tray. Drizzle with olive oil, toss to coat and sprinkle with salt, pepper, and fresh thyme. Bake at 425F for about twenty minutes. Move around pan half-way through baking. 7.) Melt butter and brown sugar together in small frying pan over low heat. Add pecans and cook 2 to 3 minutes, stirring constantly until mixture is caramelized. Spread out on parchment paper and sprinkle with salt, cinnamon and allspice. Set aside to cool. 8.) Add vinegar and oil to a small jar. Add honey, fresh thyme, salt and pepper if desired. Shake vigorously. 9.) Once the vegetables have cooled arrange on a bed of arugula. Sprinkle pecans, cranberries, shaved cheese and thyme on top. Drizzle dressing, toss and serve. 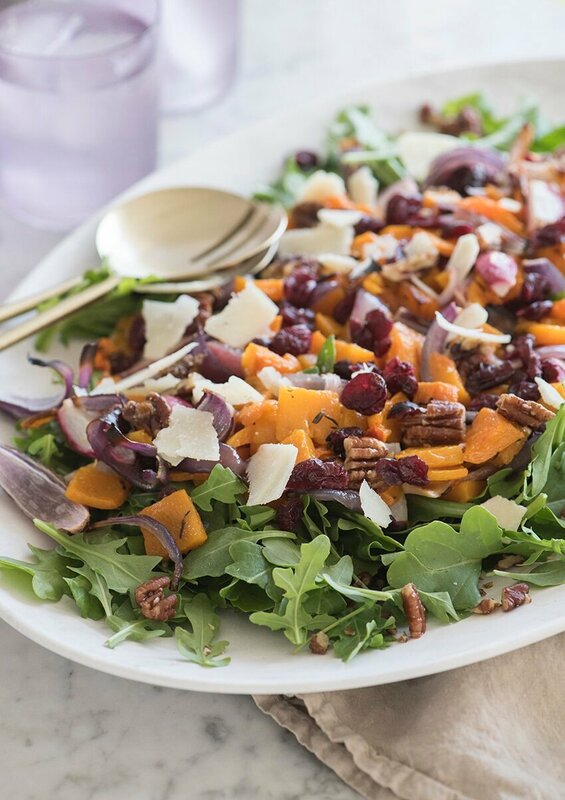 A delicious salad featuring roasted butternut squash, candied pecans, cranberries and more! Cut and peel the squash. You can start by peeling it or halving it. Use a spoon to remove the seeds. 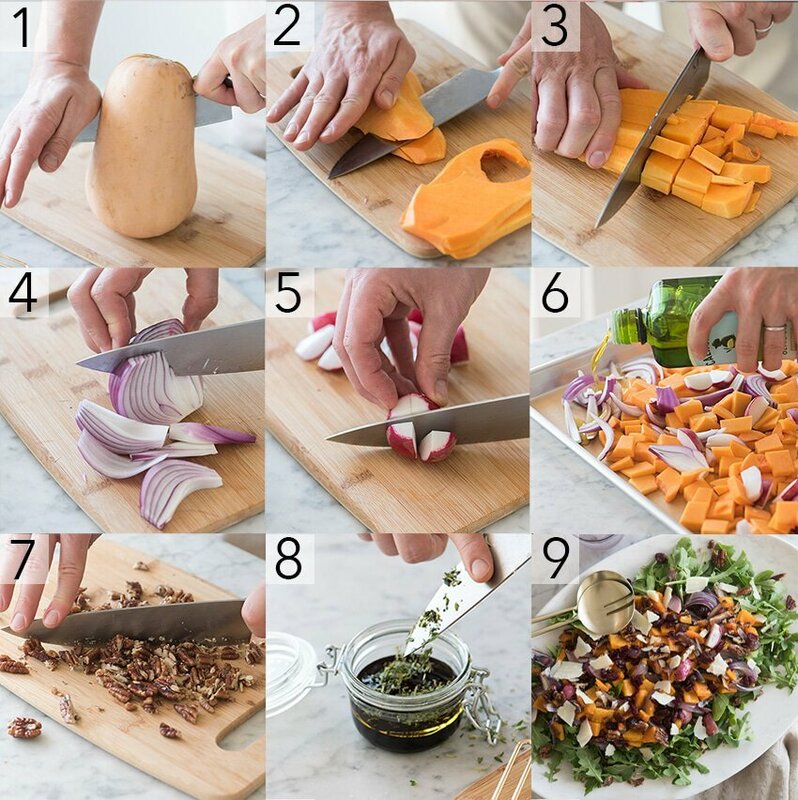 Slice the the squash into roughly half inch pieces, then chop every one inch or so. You can really cut the squash however you like but I like this size for the visual it gives and the way it sits on your fork. Trim the top and bottom of your onion, peel and chop the onions into wedges. Trim the top and bottom of the radishes and quarter. Arrange squash, onion, and radish pieces on a baking tray. Drizzle with olive oil, toss to coat and sprinkle with salt, pepper, and fresh thyme. Bake at 425F for about twenty minutes. Move around pan half-way through baking. Melt butter in small frying pan over low heat. Add pecans and brown sugar. Cook 2 to 3 minutes, stirring constantly until mixture is caramelized. Spread out on parchment paper and sprinkle with salt, cinnamon and allspice. Set aside to cool. Add vinegar and oil to a small jar. Add honey, fresh thyme, salt and pepper if desired. Shake vigorously. Once the vegetables have cooled arrange on a bed of arugula. Sprinkle pecans, cranberries, shaved cheese and thyme on top. Drizzle dressing, toss and serve. 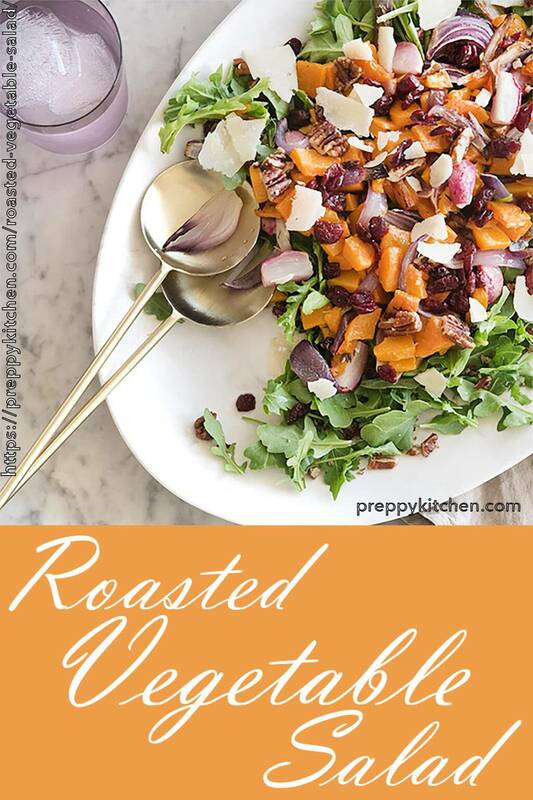 You can roast the vegetables, candy the pecans and make the dressing a day ahead and assemble before serving. I made this roasted vegetable dish tonight ..it was amazing!!! My husband couldn’t stop saying how good it was!! Thanks for a great recipe ! Thank you so much, i’m glad you both enjoyed it! It is such a tasty salad! Aww thank you sooo much for leaving that note and rating! Hope you have a great weekend!! Can I just start by saying you are amazing. I stumbled on your youtube channel by accident and since then it has been bliss. I have made your salmon recipe like a million time and love your episode with your mom. This salad looks terrific, looks like another week night go to. I am wondering if you get a chance, pretty please will you please do a thanksgiving related blog post/ episode. We are going to have Canadian Thanksgiving on October 8 and I would really like to see your take on it, the whole shebang. I don’t expect anything extensive, but would like to hear how you usually put yours together. I hope you never stop making videos. 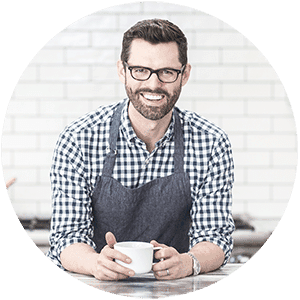 I love, love, love your savoury recipes and how you put together flavour. You are like Martha Stewart, the blog version :). That is the sweetest thing to hear and a great idea! I’ll try to get that onto my production calendar! Thanks so much!